Give children fighting leukemia and pediatric cancer a sense of normalcy. 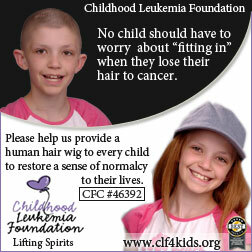 100% of your CFC gift will be used to provide human hair wigs to combat hair loss. We also provide gift baskets and ipads to put a smile on the face of child battling cancer. GOD BLESS YOU AND YOUR ORGANIZATION! First of all...let me just say "thank you!" My daughter, Sydney, was diagnosed with leukemia in October of last year. One of the hardest things for Sydney to accept was losing her hair...When the Cancer Clinic at Mission Hospital in Asheville told her about your Hugs-U-Wear program, she was so excited! She had brown, straight hair BEFORE chemotherapy, but decided to choose a blonde, curly wig for fun! She has worn this wig out! She LOVES having blonde hair! The wig is longer than her hair was before and she and her sister have tried different "looks" with the wig... pig tails, side pony tail - her personal favorite! Her Hug U Wear has certainly made this road for her a little easier to travel. She is happy without the wig but feels so much MORE confident with it! We cannot thank you enough for such a wonderful organization! What a true gift you are giving to all children facing cancer! Hair certainly does not define a person but it definitely makes a world of difference in the life of an 8 year old little girl! We truly thank you for your generosity!